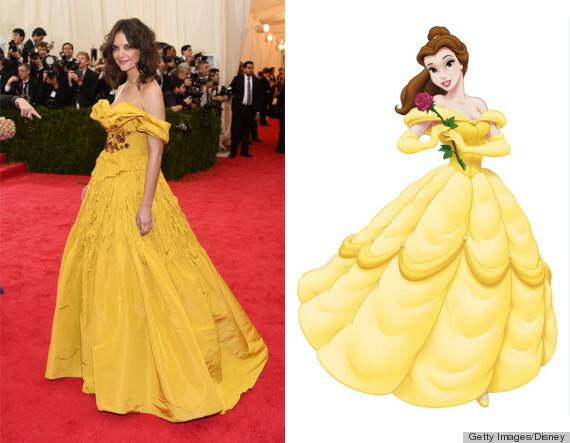 Last night at the 2014 Met Gala, Katie Holmes showed up looking a LOT like Belle from "Beauty and the Beast." The only thing that was missing from her outfit was a single rose. Although the dress was elegant, we can't seem to shake the fact that she resembles the Disney princess. Where are your white gloves, Katie? The yellow-gold Marchesa ball gown draped off the shoulders, and it had several ruffles on the skirt and embellishments along the bodice. Holmes' beachy waves and bronze makeup rounded out this red carpet look. We don't blame you Katie because we wouldn't mind dressing up like Belle for a night either.